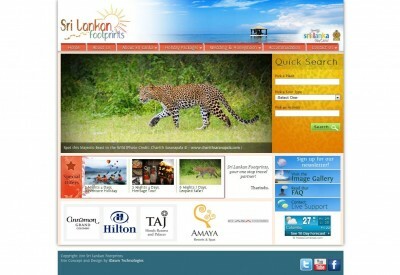 Sri Lankan Footprints required a website to feature their information as well as information on Sri Lanka, and also act as a tour search and booking system. It allows prospective travelers to search for available tours and inquire about it from the Sri Lankan Footprints. The system includes a simple search with one filter and an advanced search with multiple filters for users to search for their tours. This system does not integrate in any way with the existing infrastructure of the Footprint Tours and serves only as a web front end for the promotion and reservations of tours. Apart from the Web Design and Development aspect, Sri Lankan Footprints also asked for the SEO package which included keyword strategy, title tags, META tags, SEO optimization and social media mechanisms. Tours can be categorized by type etc.